So, I've been grounded from my crafting for a little bit. 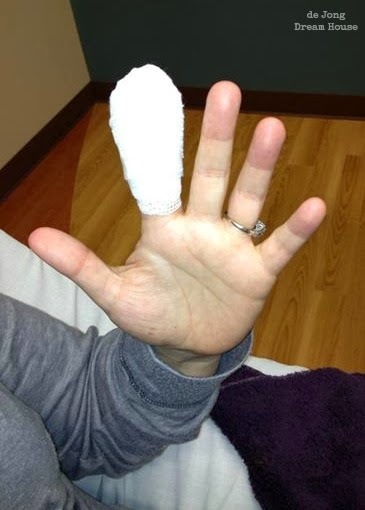 Turns out my rotary cutter is really, really sharp. 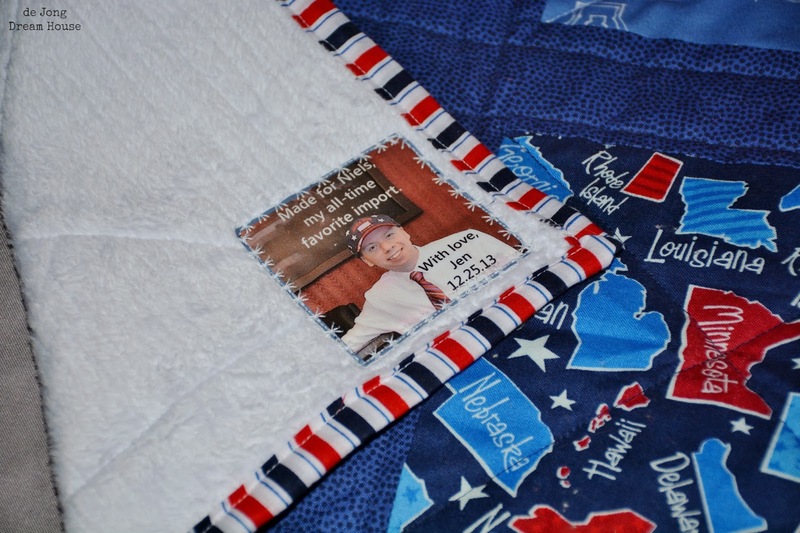 Now that I'm coming off my pain meds, I have some time to write about another quilt I finished: Niels' citizenship quilt! That's right, ladies and gentlemen, my Dutch husband is now an American! 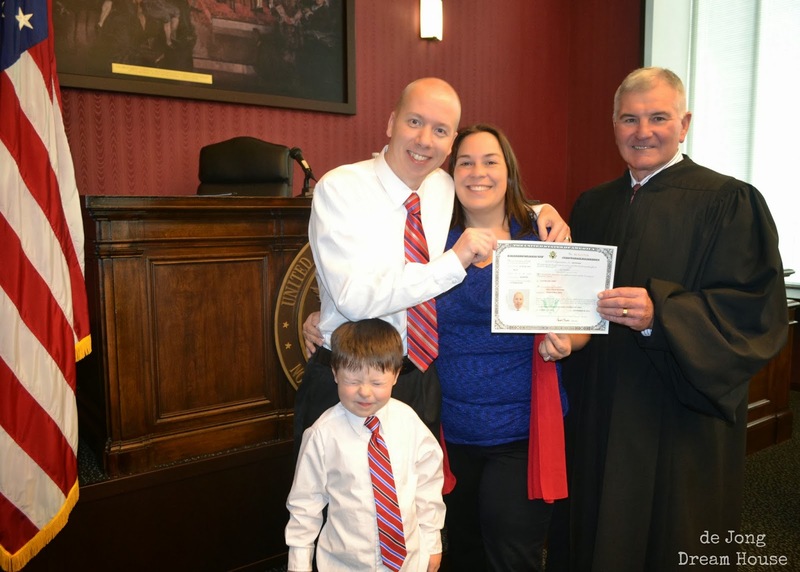 (And still a Dutchie, he is a new dual citizen). Not the most photogenic family photo of Niels' big day, but the best of the bunch! The ceremony was in September, shortly after I tore my meniscus, so I was in rough shape, but I wouldn't miss this event for the world! 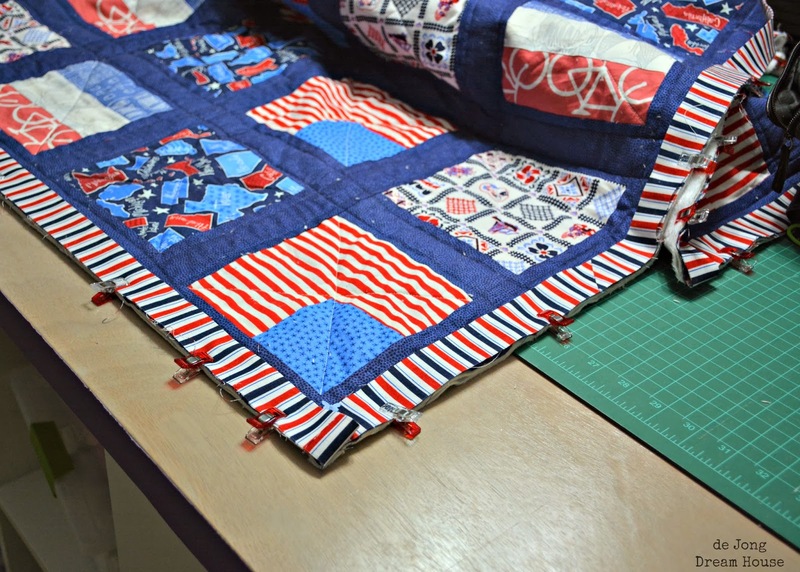 Now you have an idea of how behind I am in my posting...and my quilting! It took almost as long as the citizenship process! Okay, not quite that long! 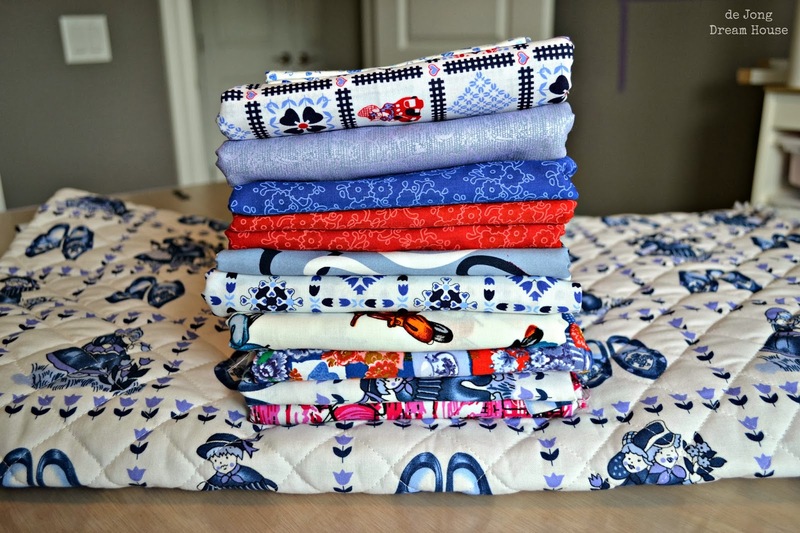 I first started gathering fabric for this quilt last May when we were in Florida. 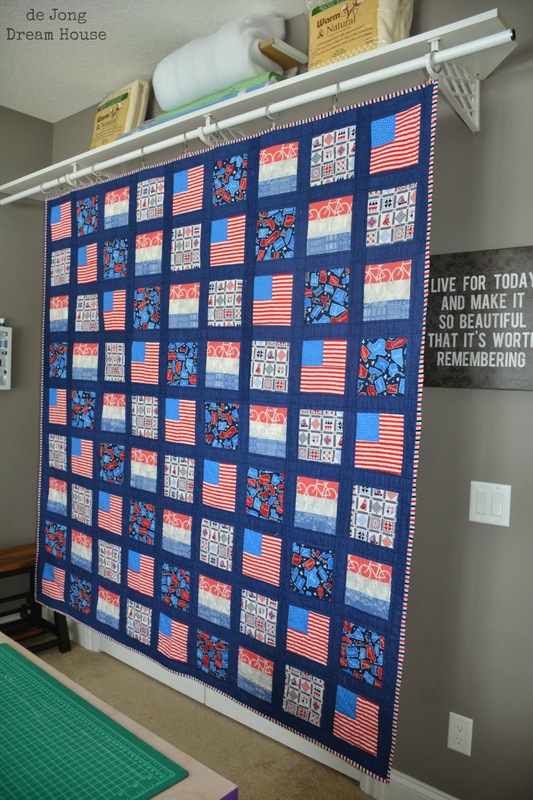 I saw the blue star fabric and the red and white fabric during a Walmart stop and thought they could make a cute American block. 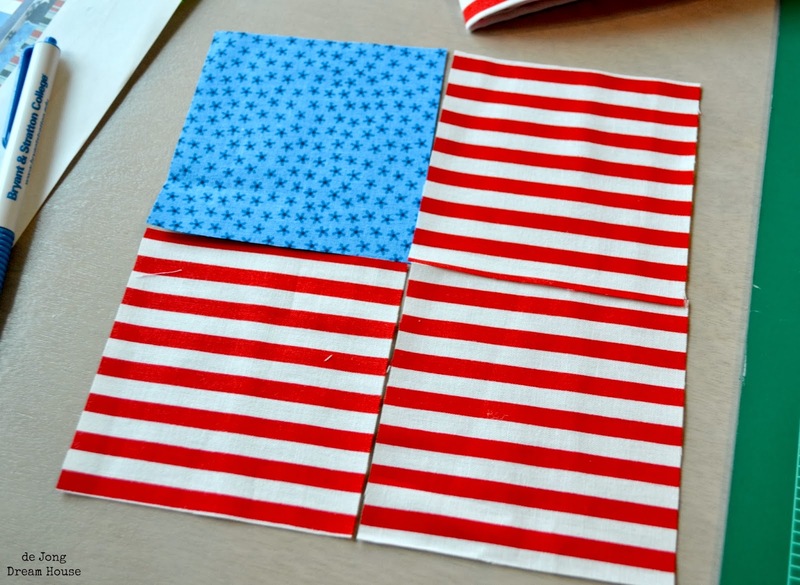 (Of course, after I was done making all the flag blocks, I realized I could have saved a lot of time by cutting rectangles instead of squares for the bottom half. Live and learn). 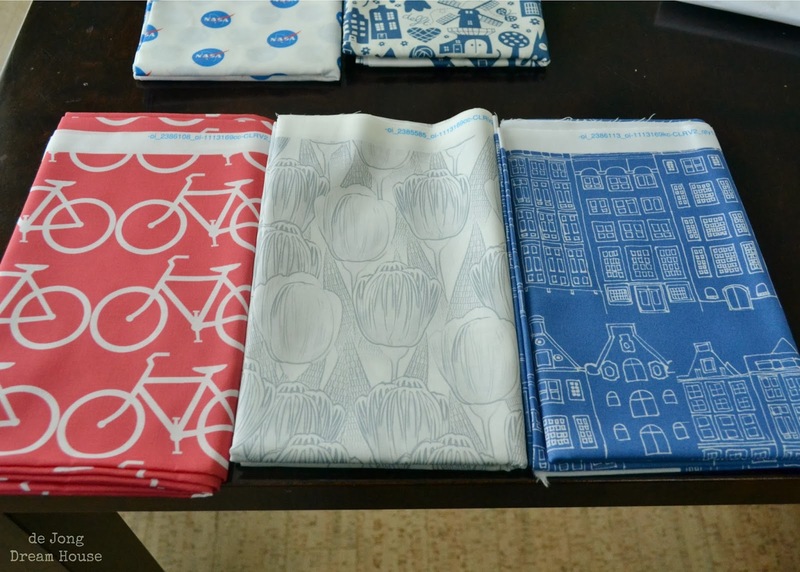 When we went to the Netherlands last summer, I looked all over for just the right Dutch fabric. 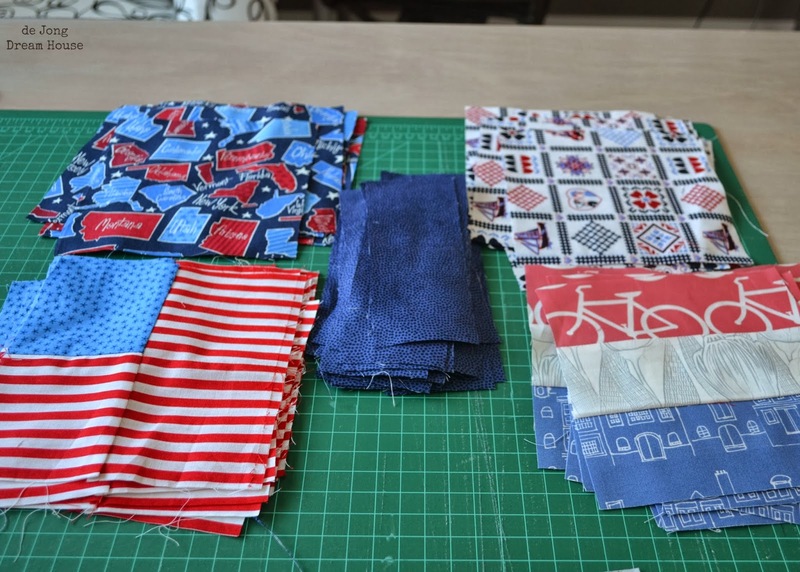 I found a lot of great fabric, but not exactly what I was looking to use in Niels' quilt. 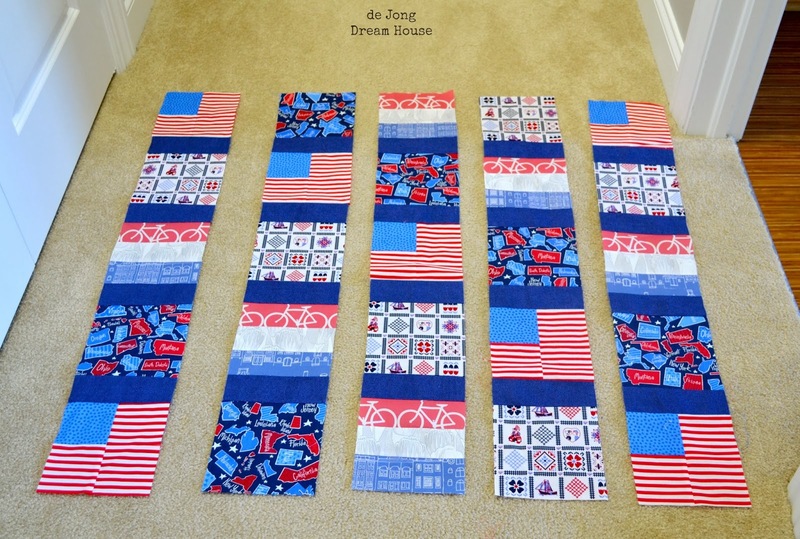 I did use the Delft fabric on the top of the stack, but to make blocks to mimic the Dutch flag, I bought three different fabrics from Spoonflower. Bikes, tulips, and canal houses. Doesn't get more Dutch than that! 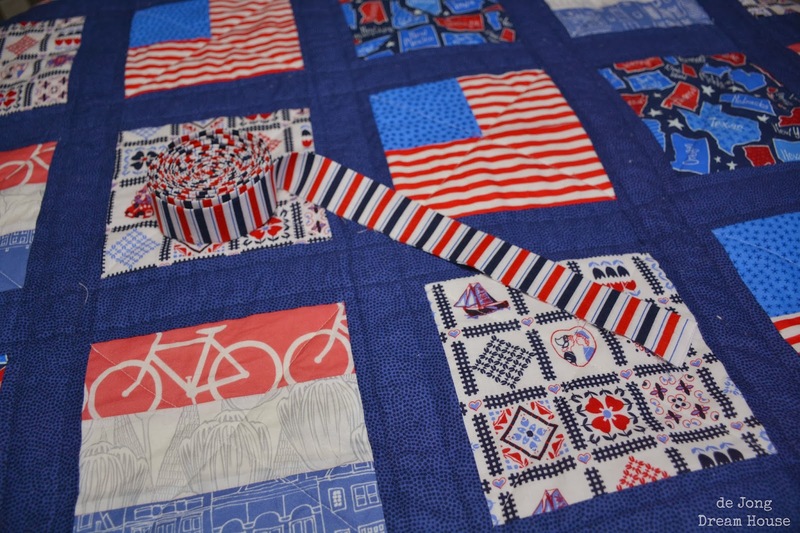 My original plan was to make an American side using the flag blocks, and a Dutch side rail fence, like this. However, Niels loved the soft cuddly minky I've been putting on some of the other quilts I've made--and really, who wouldn't? !--so he asked for minky on the back of his quilt. I thought I was back to the drawing board when Niels and his design apprentice came up with this idea. 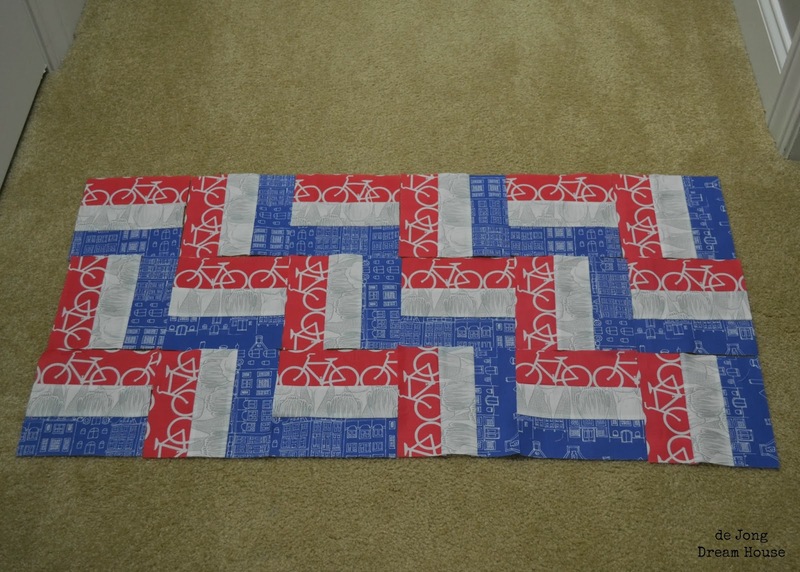 After opting for dark blue sashing, I was able to whip out a template. 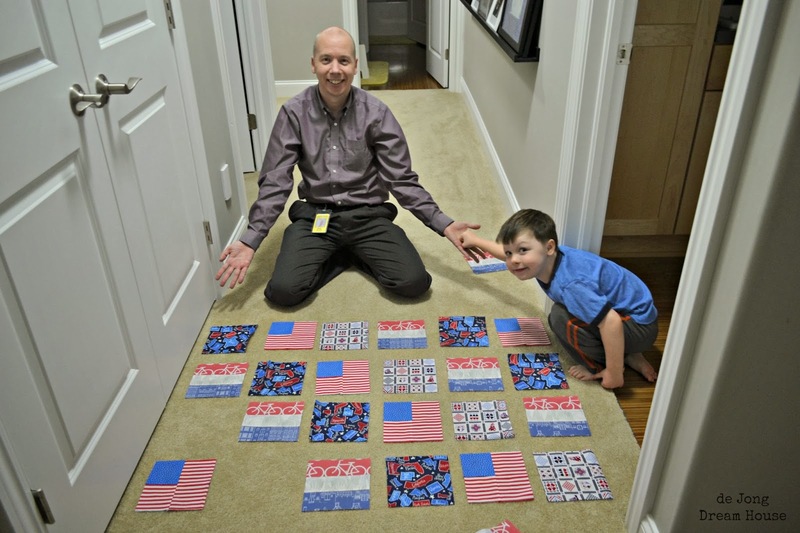 I needed 21" 6.5" flag blocks. 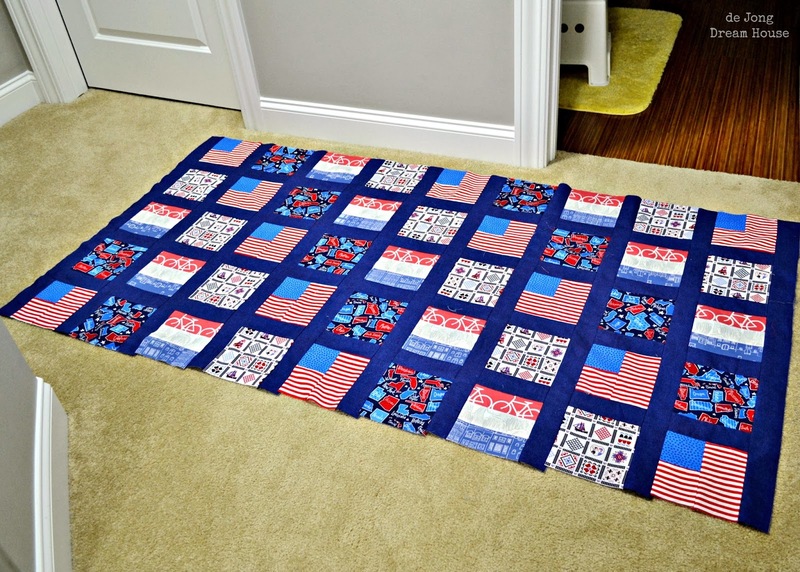 Each block included 1 blue 3.5" square and 3 striped 3.5" squares, for a total of 21 blue squares and 63 red squares. As I mentioned above, if I wanted to save myself some time, I would have cut 21 striped squares and 21 3.5" x 6.5" rectangles. 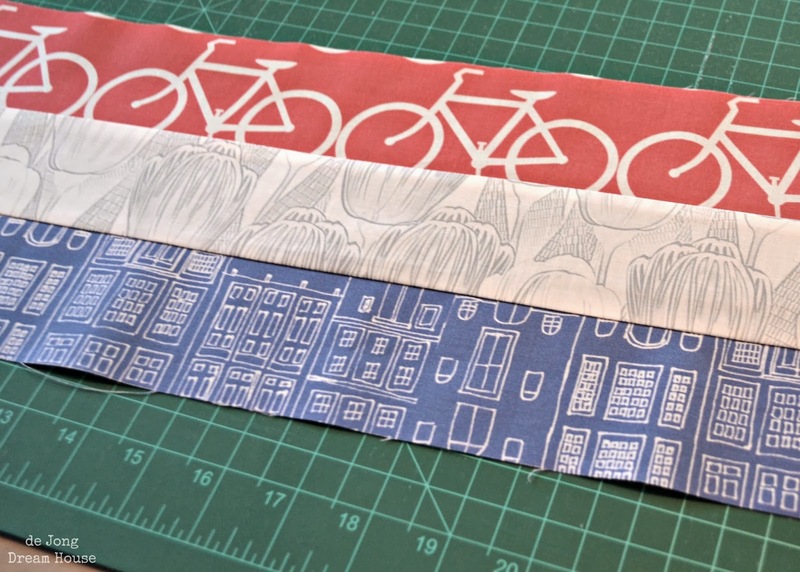 For the Dutch flags, I cut several 2.5" strips each of the red bike fabric, the white tulips, and the blue canal house fabrics. 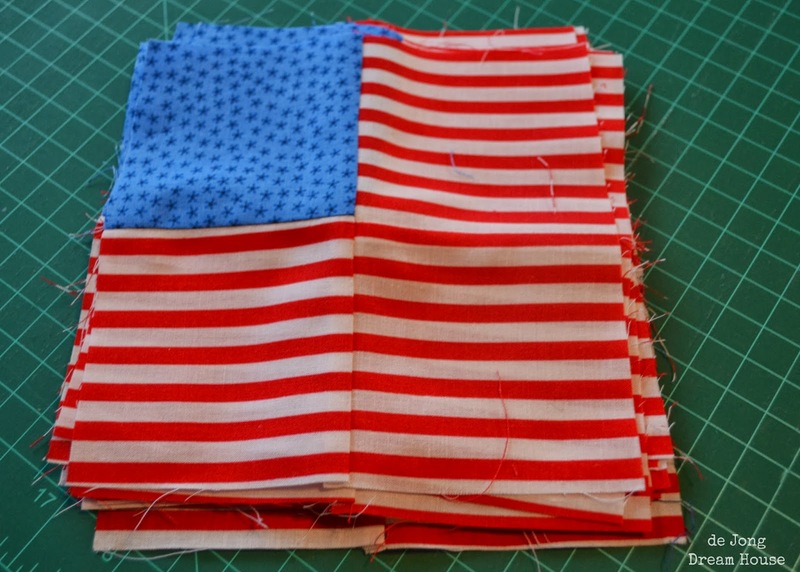 I sewed one red, one white, and one blue strip together (order was important, of course). 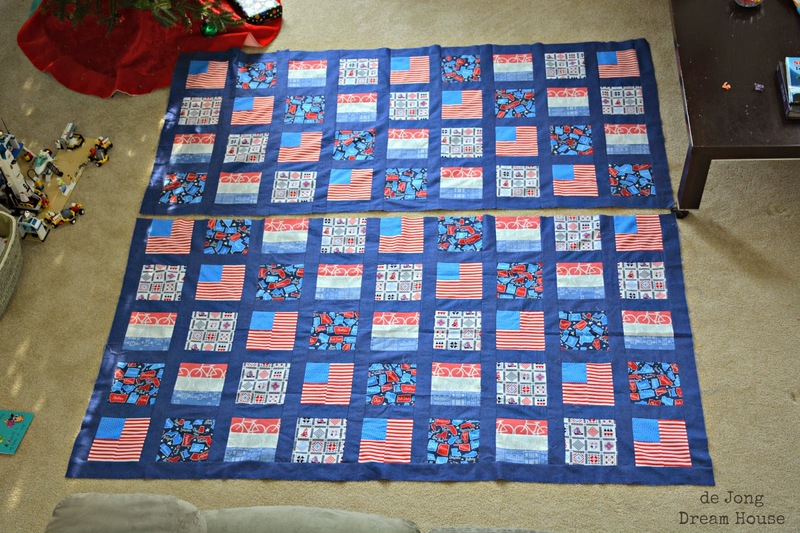 Then I cut the long strips into 20 6.5" squares. 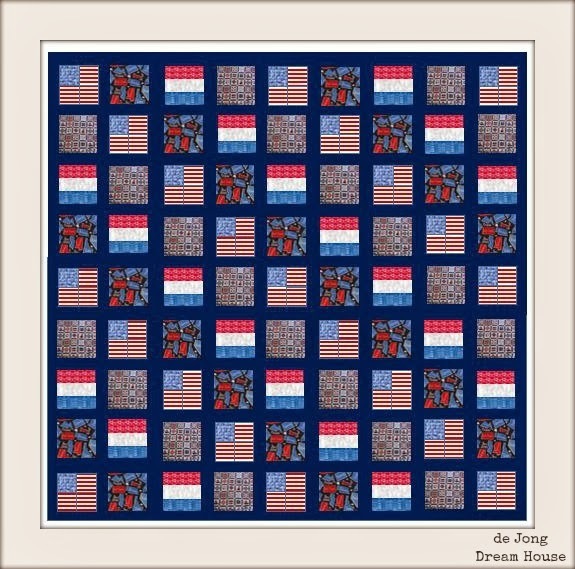 The Delft fabric and state fabric were easy: simple 6.5" squares, twenty of each. For the sashing, I cut 72 2.5" x 6.5" rectangles. 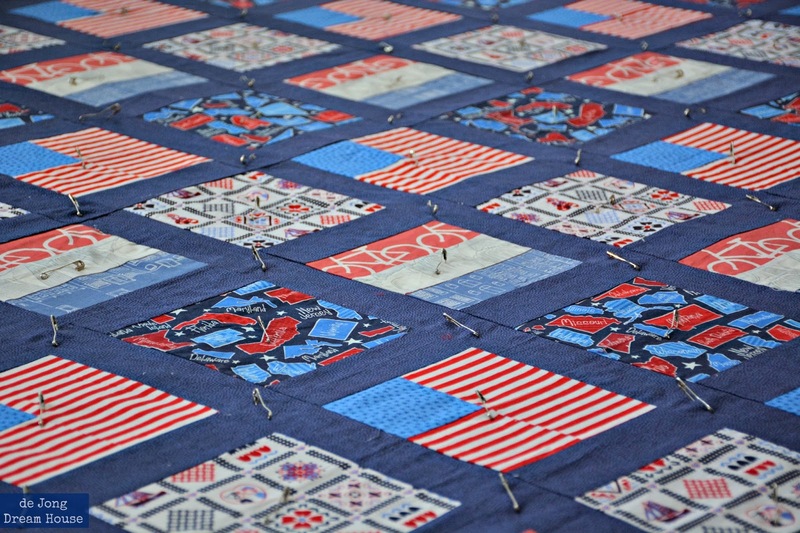 (I cut many, many width of fabric strips later to connect the rows). The columns came together very quickly. 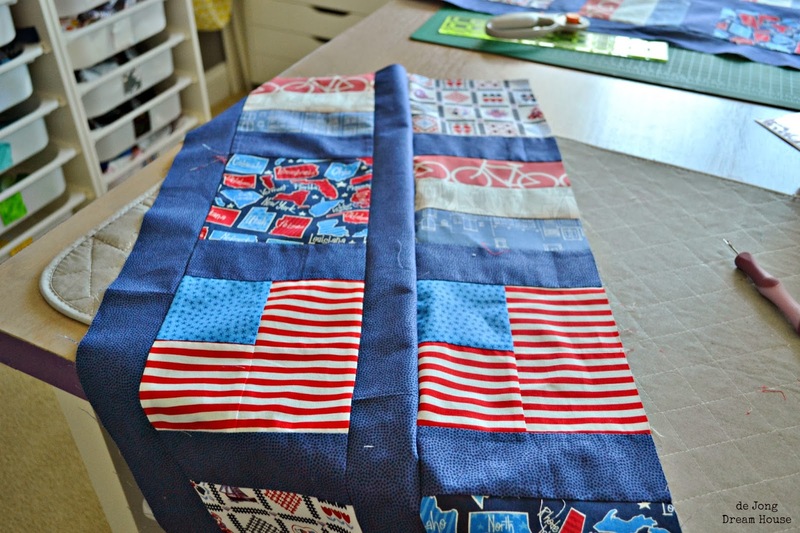 Once the columns were done, I added the long width of fabric strips in between the columns. It was a good thing I stopped to take a photo, so I could notice that I put these columns together in the wrong order. Hello there, seam ripper! 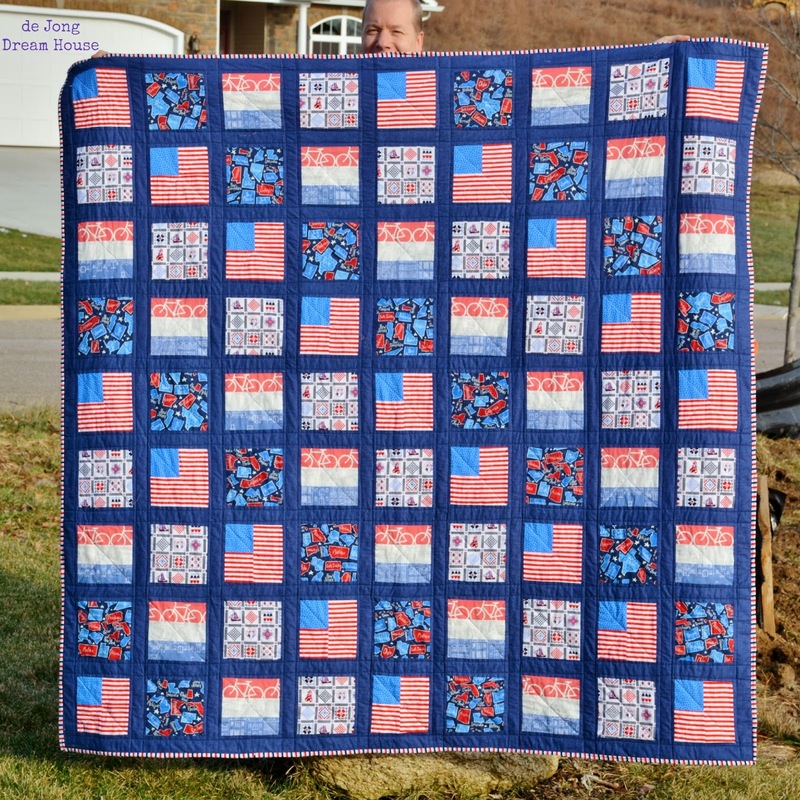 I should mention that this quilt keep getting bigger and bigger. Originally, I had planned on 25 total squares (plus sashing). That looked too small, so I added four more vertical rows. But the dimensions were off, so I added four more rows on the bottom. ...But it didn't stop me from trying. 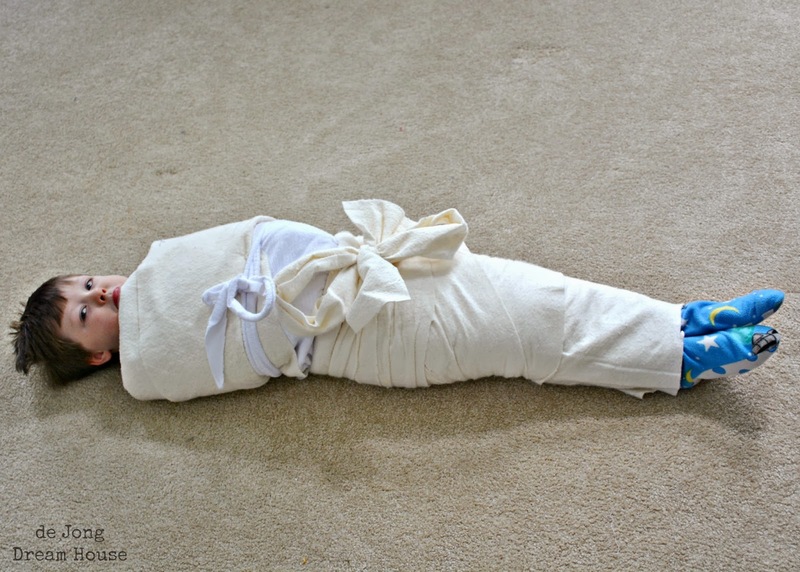 I spent quality time on Christmas Eve with D (and baby Jesus) making a quilt sandwich. Pinned and ready to quilt! 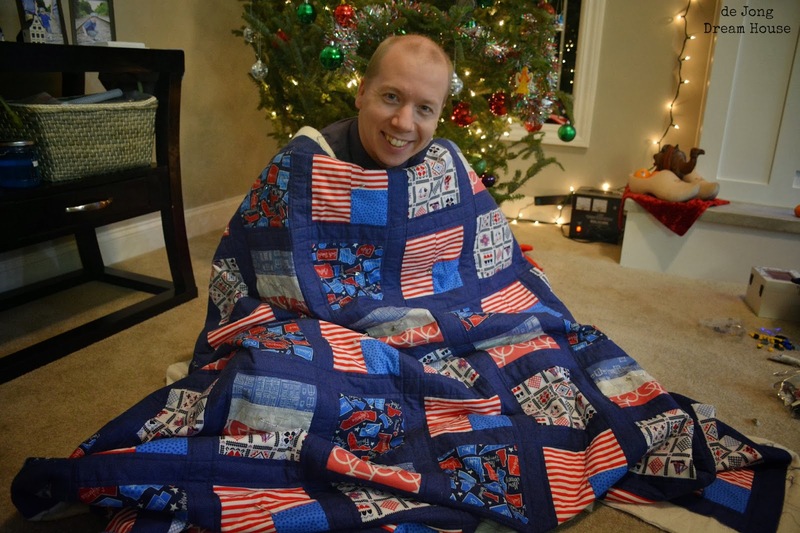 I was able to get the quilting done before we opened gifts Christmas Eve after church. 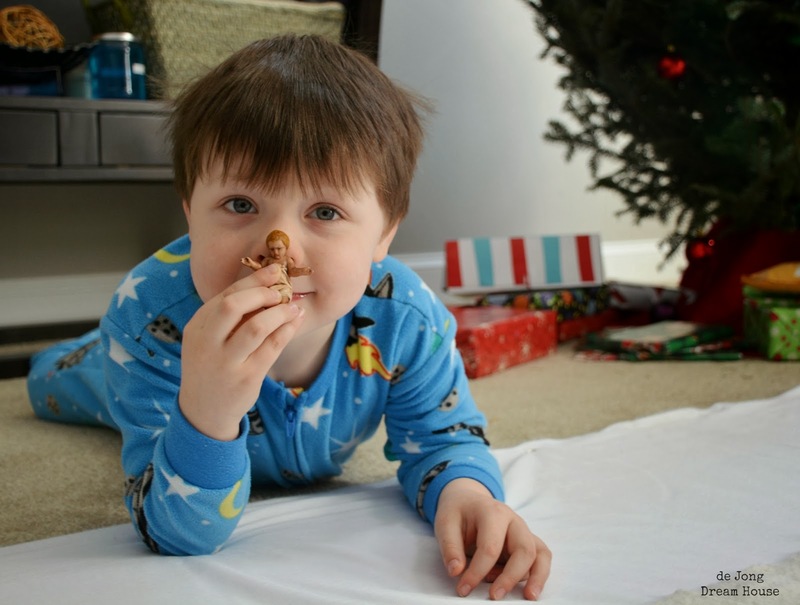 He didn't mind that his Christmas gift didn't have a binding. Pretty nice Christmas Eve. 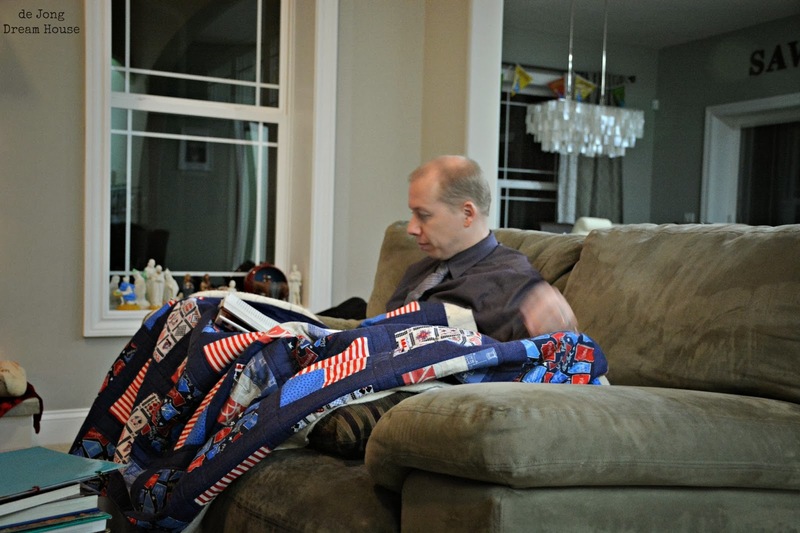 Cuddled up with a new quilt and reading after D was put to bed. 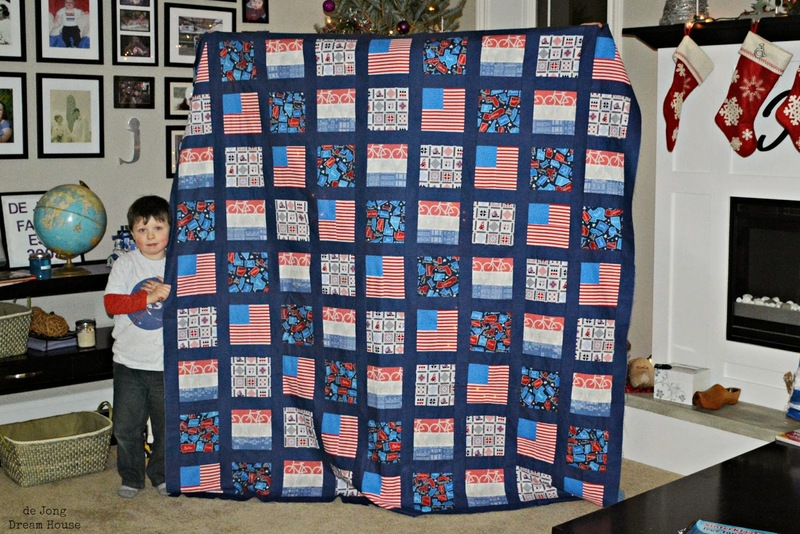 December 26, finally got the quilt back from the boys--they both love it!--to finish the binding. 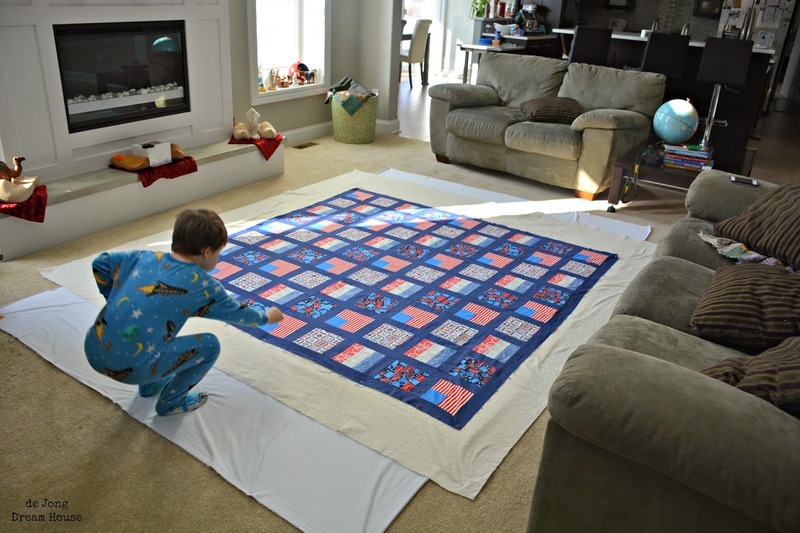 Neither boy would let the quilt get too far out of his site. I was able to put my Christmas gift to good use. I LOVE these Clover Wonder Clips. 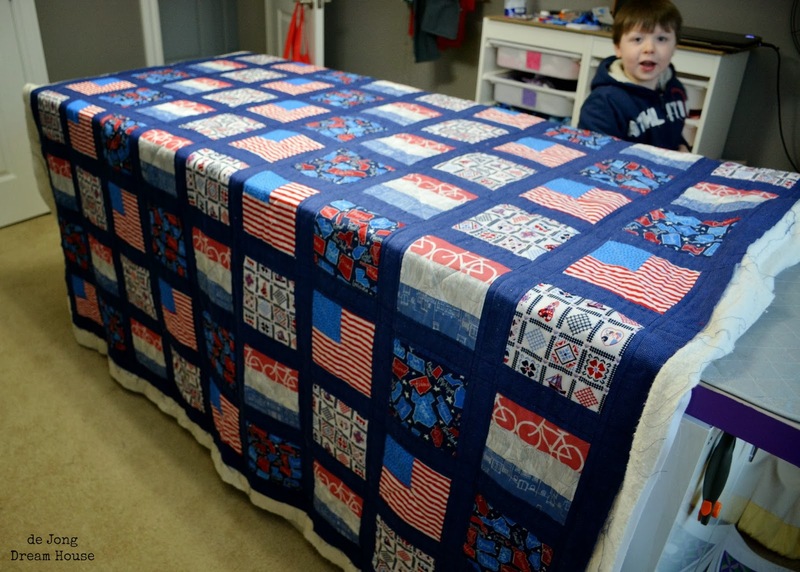 I'm excited to have a finished quilt around me at home. When I'm not cuddled up with it, it serves as inspiration on my new quilt rack. What a marvelous present! Love the fabrics, the design, and the picture/label on the back! Where did you get that amazing Dutch delft type fabric? My mother in law loves it and I'd score major brownie points if I can get it for her.